Is this the best option for an SMB mini PC? We believe so, with the V1 offering better performance, upgrade potential and connectivity than rivals. The flood of small form factor personal computers on the market means that it has become increasingly difficult for vendors to differentiate themselves from their competitors. This is particularly true given the razor-thin margins they tend to live on, which explains why corners are often cut where possible, and why sometimes some rival models share similar features and chassis. This is the case for the Vorke V1 and the Pipo X6S. We're checking out the former today, courtesy of Geekbuying, which is selling this mini PC for around £160 (about $210, AU$280), but that's subject to exchange rate fluctuations. That includes delivery but excludes VAT and potential handling fees, which may add another 25% to the price. The device is not available from eBay or Amazon at the time of writing. Before you commit to any purchase, it's well worth checking out our guide to buying tech from online Chinese retailers. The Vorke V1 is significantly bigger than the Voyo V3 or the Beelink BT7 that we reviewed recently. But there is a good reason for that. The main appeal of the V1 is that it is easily upgradable. There are just four screws to take out in order to access the entire motherboard (only one if you want to add a 2.5-inch hard disk drive). 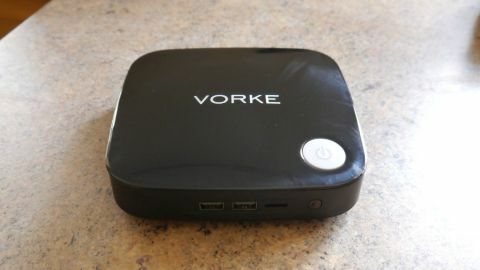 The outside of this compact box is as unimpressive as it gets – it has a reflective piano black cover with a big 'VORKE' logo written on top as well as a grey power button the size of a two-pence coin. You simply can't miss it – the location of the button means that you will have to access the top of the device in order to switch it on or off, unlike most of its competitors. Vorke provides mounting brackets and screws as well as a power cord with a power supply. There's a selection of ports on the front (two USB 2.0 ports and a microSD card slot, along with an IR receiver), and at the back of the device, you've got two USB 3.0 ports, an audio socket, VGA, HDMI and a Gigabit Ethernet connector. On either side of the box are air vents to cool down the CPU with a small heatsink and fan also helping out. Flip the V1 upside down and you will find a circular stand that can be removed by unscrewing one screw – doing so reveals the motherboard and a free SATA connector that can accommodate a hard disk drive or an SSD, as we mentioned before. You will have to remove a few more screws to access the rest of the components. Those comprise of a single ADATA 4GB DDR3L memory module (upgradable to 8GB), an Intel Wireless LAN card supporting 802.11ac Wi-Fi and Bluetooth 4.0, and a 64GB Foresee mSATA SSD (to which you can add another 2TB hard drive). The processor used by the V1 is a Braswell-based model, an Intel Celeron J3160 which looks a lot like the Atom x7-Z8700 from last year but with a slightly lower turbo frequency (2.24GHz compared to 2.4GHz). Both these processors have four cores and handle four threads, are fabbed using a 14nm process, have 2MB L2 cache and a base frequency of 1.6GHz. The J3160 supports dual memory channel but the V1 has only one memory slot. Another difference between the two models is the integrated graphics (Intel HD Graphics 400 versus Intel HD Graphics). The former has a higher base frequency (320MHz compared to 200MHz) but a lower execution units (EU) count of 12 rather than 16. On paper, both should perform equally well on light tasks, the type of workload you'd find in a SoHo/SMB environment or a thin client scenario. The V1 runs Windows 10 Home 64-bit – which you can upgrade to Windows 10 Pro – and you should be able to install Ubuntu on it. In use, we didn't experience anything out of the ordinary bar the noise of the fan; using Google Chrome, playing some YouTube videos and some light in-browser gaming were all performed without hiccups. One missing feature that might be a deal-breaker for some is the absence of holes for VESA brackets – so you won't be able to hang the V1 on the back of a TV or monitor. This is perhaps the best mini PC we've come across for SMBs. The fact that it has a VGA port and allows for upgrades means that you can connect it to a legacy monitor. System admins will also appreciate the Gigabit wired connectivity option as well as the SATA port connector, the 802.11ac Wi-Fi and the Windows 10 license. The ability to run Ubuntu is also commendable although unless you're a Linux aficionado or anti-Microsoft, we'd fail to see why one would get rid of the existing Windows 10 installation. The competition is composed mainly of the Voyo V3, the Nexbox T9, the Pipo X6S and the K6A. All of them are cheaper but other than the V3, the rest use the slower Intel Atom Z8300 CPU. The real threat to this device, though, comes from laptops – not barebones. A laptop with a touchscreen display and a 500GB hard disk drive costs around £220 (around $290, AU$380) in the UK. Sure, it may not come with the expansion capabilities of this mini PC, but it is an infinitely more flexible option, especially if you're a business and don't want to worry about the hassle of aftersales.